My quilts these days are frequently red, white, and blue because I am often making Quilts of Valor. 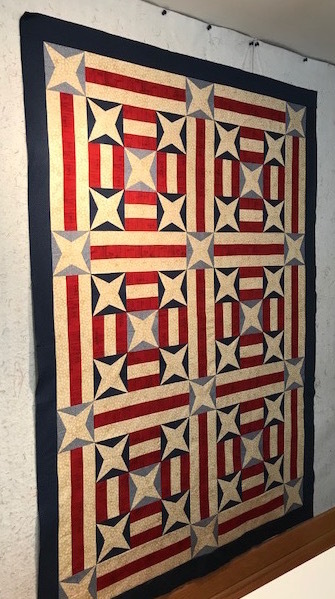 My latest patriotic work was inspired by a vintage WWII beauty in the collection of quilter-historian-researcher-lecturer Sue Reich, who also happens to currently chair the board of directors of Quilts of Valor Foundation. The pattern for Sue’s antique quilt was published as “Star Spangled Banner” in the September 10, 1941, edition of the Kansas City Star. I saw it when the quilt was on loan to the Iowa Quilt Museum for display during the museum’s 2017 exhibit of Quilts of Valor. I was immediately intrigued by the large blocks with striped sashing. I finished my updated (as in paper pieced) version this past summer, on July 4th, as a matter of fact. “Star Spangled Banner” is one of the quilts that will be featured in TV episodes I will tape at Iowa Public Television studios in September with host Sara Gallegos, part of Series 3300 of “Fons & Porter’s Love of Quilting.” Sue is loaning the original quilt from her collection to hang on the set, and I’m excited to see the original again. Quilters typically give away most of the quilts they make—often as comforting gifts to family and friends. Something extra-special happens, however, when the gifted quilt is not a gift at all, but an award presented by a civilian sewist to a military service member in order to thank him or her for military service. These awards are often life changing for combat veterans still struggling with war demons or veterans who’ve never received a word of thanks for putting their lives on the line. National Service can be a complicated as giving one’s life for one’s country, or as simple as making a Quilt of Valor. I look forward to awarding this QOV once it’s made its appearance on Love of Quilting! This would be a great pattern to make for Quilts of Valor. Can you tell me the finished size? I would love it if you could share with Quilts of Valor Foundation members. So glad you like it! I can’t remember the exact size, but it is at least 60×80, so ideal for a QOV. Full instructions will appear in a future issue of Fons & Porter’s Love of Quilting magazine, so be ready with your red, white, and blue! This is amazing Marianne! I can’t wait to watch the LoQ show. I love it when you are on. The quilt looks really great! So patriotic. Sue, I’m so glad you like! Stunning, Marianne. The vintage pattern is so classy. It draws the view in and around. Colors are a nice asymmetrical balance. I especially like the red. It is a teensy bit yellow and really makes the blues sing. Is there a pattern for this quilt? I have searched with no luck. Such a patriotic quilt! Hello Jen! You’ll be happy to know the pattern for Star-Spangled Banner is in the latest issue (March/April) of Love of Quilting magazine. If you’re a subscriber, you should have it soon. I believe it will go on newsstands any day now, and will be displayed through early April. Glad you like it!